“But they got the suspect.” … THAT’S NOT THE POINT!!!!!!! Also posted at Red State Eclectic and Three Stooges. If you would like to post this elsewhere, please just link to this URL as I update my articles frequently. Thanks! 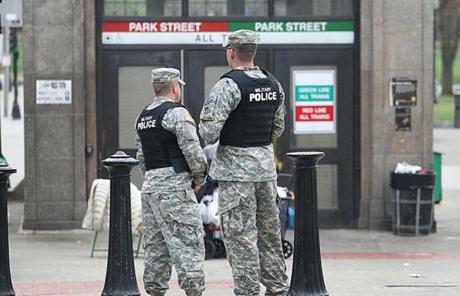 Here are 30 thoughts about the martial law which was imposed on Boston in the name of apprehending one bombing suspect. 1. The Marathon bombings constituted a horrible crime. Likewise for the killing of the MIT police officer. Thoughts, prayers and condolences need to be offered to all affected. 2. The suspects could be totally guilty. 3. The suspects could be totally innocent. 4. 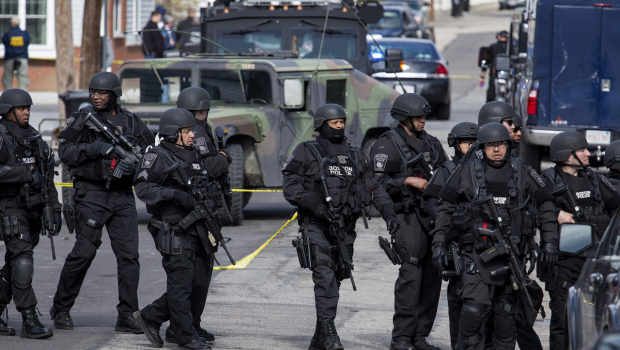 The suspects were at large for over 3 days, but Boston was not on lockdown. 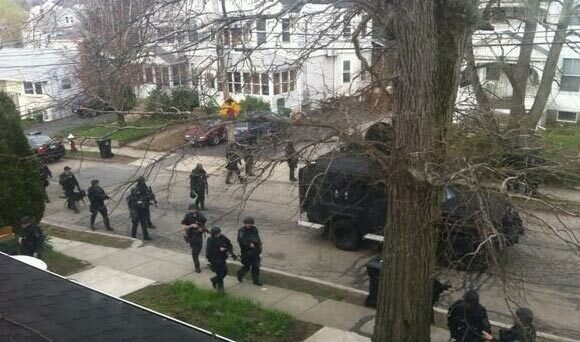 Then, all of a sudden, it was deemed necessary to put Boston and several surrounding towns on lockdown. 5. 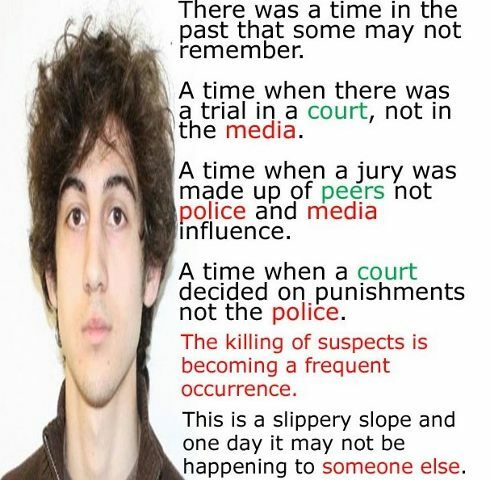 Is this the way it is going to be now in the aftermath of high profile crimes? 6. Will the American people continue to tolerate it? 7. If the answer to #6 is “yes”, this is ought to frighten you more than any terrorist. The cops are the business end of the government. And when they can put whole cities on lockdown, what can’t they – or any government entity – do? What is the next step after this? Just what kind of America awaits this young girl? 8. I am all good with cops pursuing violent criminals. This does not justify martial law. 9. Why am I concerned about rights at a time when suspected terrorists are on the loose? Because it is in times like this when governments want to take away liberty and people are more than willing to give up their liberty – in the name of “security”. 10. There wasn’t a lot of street crime in Nazi Germany or Soviet Russia. The cops could do as they pleased. Would you want to live in either place? How “safe” would you feel? 11. The most dangerous criminals have always been in governments. They have always sent police to do their dirty work. They always dress things up in the name of some higher good. 12. 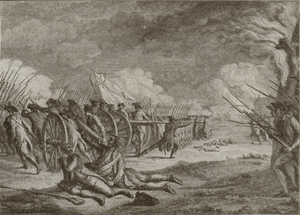 238 years ago today, near Boston, “the shot heard ’round the world” was fired. King George III did a lot of bad things. Did he ever put an entire city on lockdown? Lexington Green. 13 miles from Boston. 238 years ago today. 13. 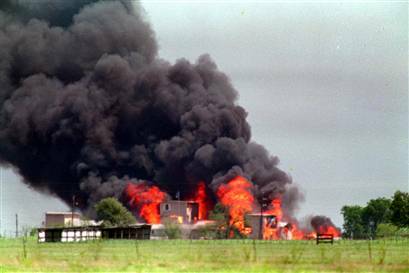 The lockdown of Boston in pursuit of one accused terrorist came on the 20th anniversary of the torching by the feds of 80 innocent citizens near Waco. This was a trial balloon that was floated before a brainwashed nation to see just how much Uncle Sam could get away with. As it turns out, he can get away with just about anything. 14. 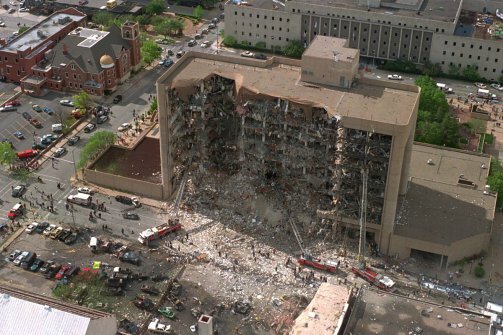 The lockdown of Boston came on the 18th anniversary of the bombing of the Alfred P. Murrah federal building in Oklahoma City. Several witnesses claim to have seen a suspect known only as John Doe #2. A fugitive suspect in a bombing that killed 168 people did not cause the area around OKC to be put on lockdown. 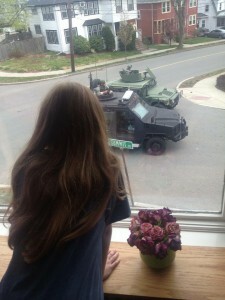 Why, then, was it necessary to put Boston and several suburbs under martial law after the killing of four people? 15. “But these were local police”, you say. 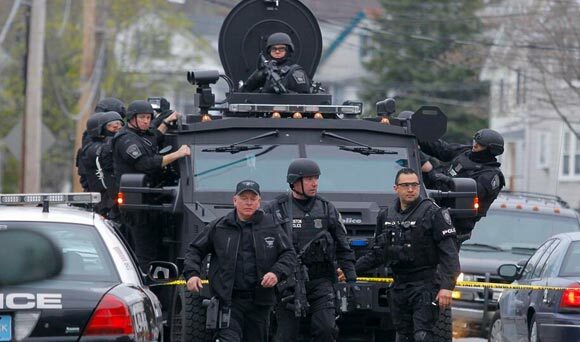 Police have become more and more militarized and federalized in recent years, especially since 9/11. Can anyone here say “occupying army”? 16. The media parrot everything the authorities say. 17. Millions of Americans believe everything the mainstream media says. 18. Fox News, Rush Limbaugh, Sean Hannity, Mark Levin, etc. etc. are part of this mainstream media. 19. The 5th Amendment demands due process regardless of the severity of the charges or the weight of public opinion against the defendant. 20. The 6th Amendment spells out the details of due process. 21. If these protections don’t apply to the suspects here, they don’t apply to you or me either. 22. If you will cheer on the authorities in this instance, you had just better hope and pray that you are never falsely accused of anything. 23. Most criminals are not Muslim. 24. 99-plus percent of Muslims are not violent criminals. 25. The most violent demographic in America is unmarried men. Let’s go after THEM! Oh, wait. Let’s not. I am an unmarried man. 26. It is always easy to say that your government should “do something” as long as they do it to somebody else. 27. NEVER GIVE UP YOUR GUNS! They are your last line of defense against any kind of crazies – be they terrorists or rogue police. 28. How many military veterans who “fought for our freedom” were on the receiving end of Friday’s lockdown? 29. You will note that I have not said anything about conspiracies, “false flags”, etc. Even if everything the authorities are saying is entirely true, their reaction to the Boston Marathon bombings is totally grotesque and tyrannical. 30. Dear God, why did You task me with being a “watchman on the wall”? (Ezekiel 33:6) Why do I have to be the bearer of this kind of news? Why couldn’t You give me a “nicer” ministry? In the end, it was not martial law that caught Tsarneav, but a common citizen defying martial law by leaving his house in defiance of orders. If you would like to post this elsewhere, please email me and include a link to this URL. Thanks! This entry was posted in Uncategorized and tagged bombing, boston, lockdown, marial law, tsarneav. Bookmark the permalink. 30 Responses to “But they got the suspect.” … THAT’S NOT THE POINT!!!!!!! God decided you were best for this job. Be proud that God chose you. He chose you because He knows you will do it in the best possible way. Spoken like someone who has no clue what was actually done and why. Dear Boston resident: You’re good at ad hominem attacks – but can you actually respond to the arguments presented by Doug? That has to be one of the most meaningless and childish response to an intellectual argument that I have heard in years. I’d like to hear you make an intelligent argument. You’re so naive. I was amazed at the speed in which the town was taken over. It made me think of Nazi Germany. I got a really creepy feeling. yes, that is unnerving. Submitting like that, so easily, so quickly, without question. It makes me think that Americans are so afraid of being hurt that they will do anything to feel safe, even give up their freedom. Yes. I’d feel much safer with my own weapons and the police out of my business. 2. Martial Law is sometimes necessary. When the authorities are dealing with a certain level of threat [murders, bombings] from an uncertain number of radicals [did they have accomplices?] with access to a significant arsenal – public safety is protected by bringing the conflict to a swifter resolution. 1. The Police may have had the need to go house to house to search for the suspects. I’ll grant you that. But, a forced entry into a home, whether the owner/occupant is home or not, is not within the the authority of the police. Period. The Fourth Amendment to the Constitution guarantees that. Period. 2. Article 1, Section 9 of the US Constitution pretty much covers “martial law” it states, “The Privilege of the Writ of Habeas Corpus shall not be suspended, unless when in Cases of Rebellion or Invasion the public Safety may require it.” There was no case of rebellion or invasion! There was a man hunt for one man. Violating everyone’s rights is over stepping. Our rights are God given, not man made. Our rights come from the Creator, not from the Constitution. If the government, at any level, can override those rights for whatever reason at anytime of their choosing, then we have no rights. When government has the power to deem that their needs, desires, pursuits are more important than the rights of law abiding citizens going about their daily lives then we dangerously tread toward totalitarianism. No, they didn’t need to do that at all. They didn’t find their “suspect”, or didn’t you hear? A boat owner found the guy hiding in his boat and simply called 911. Nothing you posted has any relevance to what happened. While I believe in a God – I do not agree at all with the idea that legal rights are God-given. Which God(s)? Whose God(s)? The Us Constitution does not mention God, rather it establishes legal rights and rule of law. The Declaration of Independence establishes that our founding fathers believed that our rights are God given. The fact the the first 10 amendment to the Constitution are called the Bill of Rights connects them to the Declaration in establishing them as God given rights. The Second line of the Preamble: “That to secure these rights, Governments are instituted among Men, deriving their just powers from the consent of the governed…” To secure these rights governments are formed. These rights are already there, even before governments are formed. If the rights were not already there, granted by God, then government would not need to secure these rights, government would need to formed to establish these rights. If government were the power that established the “rights” they would not be rights they would be privileges. Rights come from God, privileges come from government. I have a right of freedom of speech, to say whatever I please, but having a license to drive a car is a government granted privileged, if I meet established requirements. I am curious…the FBI posted pictures of the two brothers asking for help from the public. If the older brother had crossed their radar in 2011, wouldn’t the FBI have pictures of him already and could easily identify him without the public’s help? And what about the police helicopter that had the thermal imaging camera? Did they detect the location of the younger brother long before the boat owner found him? Is it possible the police knew he was in the boat and was stalling so he would be deceased when they “finally” found him? I’m glad you noticed this. I didn’t. Yes, that is very interesting.